Leonotis leonurus is a versatile and useful flowering shrub for tropical and subtropical climates. It grows as a sturdy and drought tolerant shrub that can be used to fill empty landscape spaces, trimmed to make nice borders, or grown as ornamental plant for beautiful flowers and decent foliage. Leonotis leonurus grows up to 6 feet and bears flowers on long stalks. Flowers of orange color grow in small tufts along the stalk and last long. The tufts of flowers growing along the long and sturdy stalk give the plant looks of a lion’s tail, thus giving the plant its common name – Lion’s tail. Leonotis leonurus bears delicate, green foliage with nice fall colors in fall. The leaves emit fragrance when crushed. The plant comes from summer rainfall areas of Africa and parts of southern America where it has been used in preparation of traditional medication for flu, fever and headache. Since Leonotis leonurus is not fussy about growing conditions, it can be grown easily from seeds. It can grow in almost any part of the garden however a sunny exposure is good for healthy foliage and vigorous flowering. The plant can survive long spells of drought as well as occasional frost and spells of cold. Besides popular orange flowering variety, a white flowering variety of Leonotis leonurus is also grown as ornamental flowering shrub. 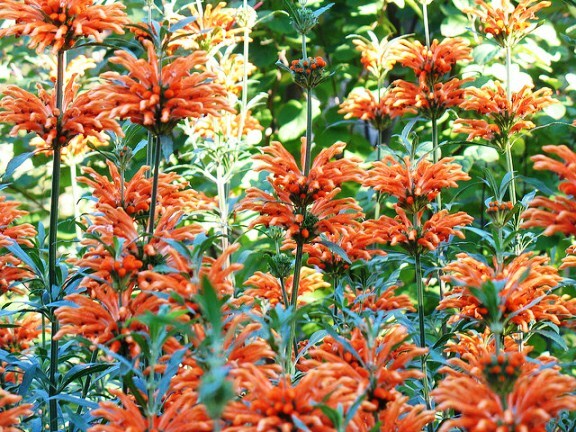 Leonotis leonurus can be a good plant to attract butterflies and birds to the garden.